A pretty common belief in many different cultures is that inanimate objects can have, or can be imbued with, supernatural powers. It's not like I haven't dealt with this topic before, here at Skeptophilia. We've had posts about do-it-yourself voodoo dolls, a haunted wine cabinet, a cellphone that received texts from Satan, and a child's doll named "Robert" which shifts positions by itself, not to mention "giggling maniacally." And that's just scratching the surface. If you start asking people you'll find everything from the common and fairly innocuous belief in good luck charms (or in items that bring bad luck), all the way up to belief that there are objects that are cursed and/or inhabited by evil spirits capable of serious damage. So far, nothing too unusual, although still examples of magical thinking that it'd be nice for the human race to jettison. But just recently, there's been a technological twist added to all of this medieval superstition. What if someone used a 3-D printer to make a perfect replica of a cursed object? Of course, it opens up the question of "why would you want to? ", but as we've seen over and over, asking that is not sufficient to dissuade people from doing something. 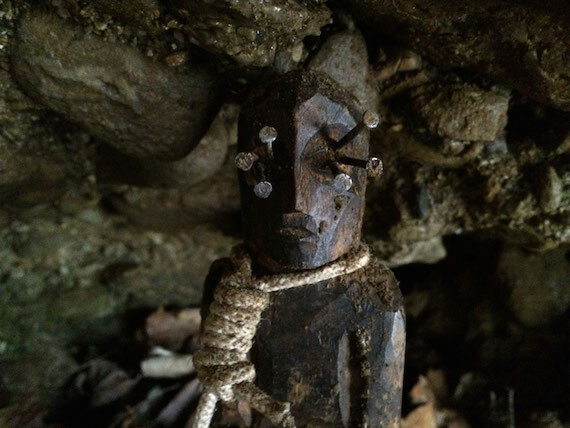 [The Crone is] a strange hand-carved statue supposedly found by some hikers stashed away and abandoned, quite possibly hidden, in a dim cave somewhere in the Catskill Mountains of New York. The doll is creepy to say the least, with a length of filthy cord wrapped around its neck and rusty nails driven into its eyes, and it seems like the sort of thing most people would cringe at and leave lying where it was, but in this case the hikers took it home with them. According to Swancer, the unnamed hikers lived to regret bringing it back with them, as immediately bad stuff began to happen, like bumps, thuds, and bangs, a feeling of being watched, and worst of all, "odd smells such as that of stagnant water or decay." ... a Mardi Gras mask. It was in perfect condition, and in fact looked like it had been placed there only moments before. It was in October, the weather was cool, and we hadn't seen anyone else in the woods during our entire hike, so it's not like this was exactly a well-traveled part of the National Forest. So it was pretty bizarre, to say the least. I said, "Hey, Carol, come take a look at this." I picked up the mask, and put it over my face. She regarded me with a raised eyebrow and said, "You do realize that if you were a character in one of your own novels, you'd be about to die right now?" Undaunted, I brought it home, and hung it on the wall in my office. I did have a bit of a turn the next morning, when I walked into the room and found the mask in the middle of the floor. Turned out the elastic loop had come loose. So I reconnected it, and it's remained there quietly ever since. No bumps, thuds, or bangs, and the only bad smells are when my dog decides to roll in Eau de Dead Squirrel and then comes to take a nap in my office. Anyhow, all of this is just to say that if I'd found the Crone of the Catskills, I'd probably have taken it home, too. The hikers who found her donated the Crone to the Traveling Museum of the Paranormal and Occult, and even afterwards it continued to do spooky stuff. The Museum's owners, Dana Matthews and Greg Newkirk, report that after the Crone was obtained, furniture was found knocked over, there was the "smell of fetid pond water," and more than once they opened the place up in the morning to find small muddy footprints on the floor leading to and from the case the Crone occupied. So far, so good. But the next thing that happened I have to admit I find a little baffling. A pair of paranormal researchers, Karl Pfeiffer and Connor Randal, decided that it'd be a good idea to use a 3-D printer to make a replica of the Crone. Havoc ensued. The printer malfunctioned and a part of it "melted." Other equipment broke down, or went missing entirely. People in the room with the replica reported "a sense of dread" coming from the thing, and a "burning sensation" from touching it. So apparently, the 3-D printer hadn't just copied the Crone's appearance, it had also copied its ghostly hanger-on. Now, as a diehard skeptic, it's to be expected that I think this sounds a little silly. But allow me to ask any true believers in the studio audience: how exactly could this work? I mean, even if you accept that an object can be imbued with a "force" (whatever that means), isn't the usually accepted explanation that it's tied to the object itself? If you made a copy of the object, you wouldn't expect a piece of the "force" to get knocked loose and attach itself to the replica. Or at least, I wouldn't. I didn't think that 3-D printers could make copies of ghosts, you know? Which, honestly, is a good thing. Just think of what would happen if you put a 3-D printer in a haunted house, and the ghosts got a hold of it and started duplicating themselves. In short order, you'd have what paranormal researchers call "a shitload of ghosts." It'd be a catastrophe, much like what happened in the Lost in Space episode "The Space Destructors," wherein Dr. Smith created an android who then began to create more androids, which was especially awful because the machine was programmed to make them look like Dr. Smith, or at least a reasonable facsimile thereof. So it'd be unfortunate if the 3-D printer did make a copy of the evil spirit haunting the Crone of the Catskills. That being said, if Pfeiffer and Randal have any extra copies of the Crone hanging around, I'd love to have one. I've got a nice space on the shelf in my office where she could reside. Also, if all she does is push furniture around and leave muddy footprints on the floor, my dog pretty much has that covered as well. 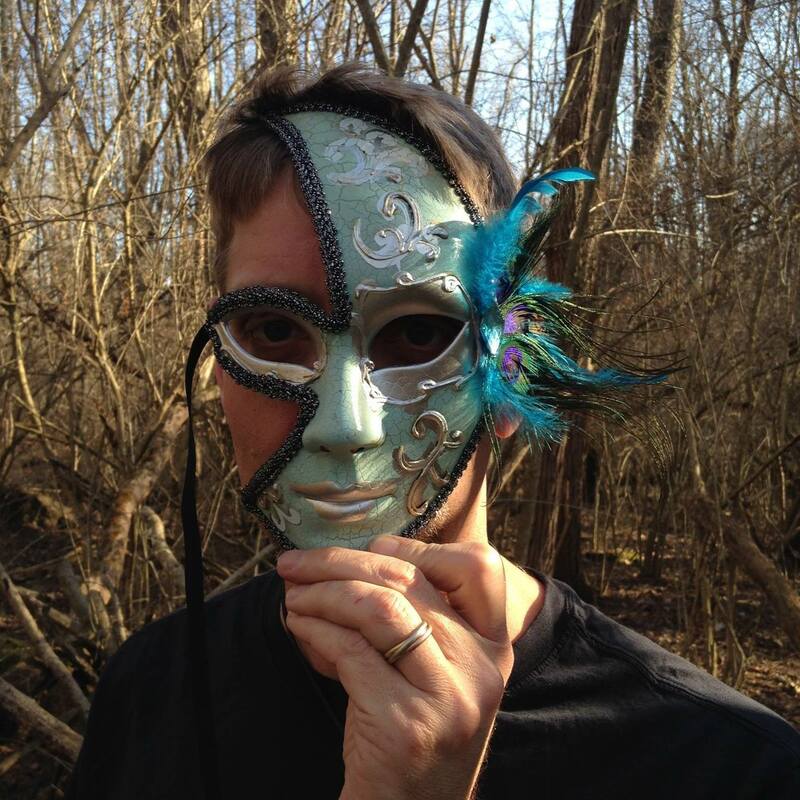 I might even see if I can make a replica of my mysterious Mardi Gras mask, and we can do a swap. I have to warn you, though, that the mask's antics are even less impressive than the Crone's. "Falling on the floor once in four years" is really not that much of a superpower.